A stout as dark as the winters that once engulfed Westeros, as robust as the men who swear their oaths at the Weirwood Tree. Chocolate and caramel sweetness are balanced by hop bitterness. Roasty, woodsy notes, and an earthy finish. As I mentioned in my review of the inaugural beer in the series, Iron Throne Blonde Ale, Ommegang didn’t really seem to take any chances with the first beer. This does not seem to be the case with the release of Take the Black Stout, which is brewed with star anise and licorice root and most definitely won’t be intended as a light, easy drinker. Take the Black Stout is slated to hit shelves in the fall just in time for the inevitable winter, so grab an extra bottle to hang on to until the start of the fourth season next spring. Winter surely is coming because this is the second post I’ve seen today on this brew. While I’m often leery of pop culture, gimmick-laced beers, this one looks to have a chance. Ommegang is, after all, a legitimate craft brewer. Wonder what might be in the offing for the next in the series… White Walker Wit, perhaps? Yea, I saw the label yesterday and debated posting it, but since I reviewed (defended) the first beer I figured I’d toss it up. Personally, I was hoping for a Stark Stout, but GRRM didn’t allow them to last long enough for that to happen unfortunately. It looks like Ommegang will be taking more risks with this beer, which is good to see. The first one was a fine enough beer for everyone to enjoy, but craft beer drinkers know Ommegang is capable of much better. Hopefully this will see them live up to their regular line. A Belgian-style stout is definitely an interesting proposition. 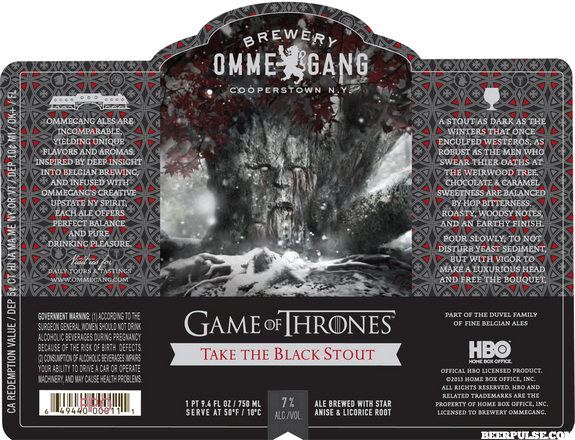 This entry was posted on June 18, 2013 by dasalehaus in Brew News and tagged collaboration, craft beer, game of thrones, hbo, ommegang, take the black, winter is coming.